dama śamamanu gangā snānamu sukhamā? kardama durviṣaya kūpa snānamu sukhamā? mamatā bandhana yuta narastuti sukhamā? What should sate you truly, O Mind? Wealth or the service of His Kind? Should milk, curd and butter, the palate cheer? Or the nectar of singing about the Sire? Into a pit of refuse one submerges. The Lord of the gods? The song and its context are very famous. Serfoji II, (Sharabhoja in Sanskrit), the scholar king of Tanjore, in whose domain Thiruvayyaru, Tyagaraja's hometown fell, is said to have invited him to perform at the palace and to be rewarded with much gold, in the early 1800s. Performing at the palace meant performing at the king's pleasure and not purely in the worship of the Lord. It might also have meant panegyrizing a mortal, or "narastuti". Tyagaraja, predictably, refused the king's offer with this song. Eventually, the king, himself a composer, visited his hometown and listened to Tyagaraja sing. Serfoji II, the last king of Tanjore to have had monarchical powers, was a widely read scholar, with an Indian and a western education. It has even been recently claimed that he had pioneered cataract surgeries. A less enlightened king of that time might have considered Tyagaraja's refusal an insult and jailed and tortured him. As another version of the legend goes, after his offer was declined, Serfoji II ordered his soldiers to fetch him, but immediately suffered a searing pain in the stomach. This remained incurable, until Tyagaraja prayed for him, when Serfoji II visited him. About the verses: There is a subtlety in my using 'His Kind' for, "Rama's Sannidhi" or Rama's abode. One meaning of kind is 'family' or class. Rama is the only major god in the Hindu pantheon, who is generally depicted in his temples with his entourage, Sita, Lakshmana, Hanuman etc- the "Rama parivara" or the Rama family. In most other temples, the Lord, be that Siva or Vishnu, will almost always have a separate shrine set apart from His consort. This is according to the laws governing structural and liturgical practices in temples. In the South of the country there are two main sets of rules or Agamas for Vishnu temples, that apply to Rama temples too, the Vaikanasa and the Pancharatra Agamas. Some famous temples precede the known redactions of these rules, for example the famous and wealthy Tirupati temple. Again, you may take service to 'His Kind', as meaning service to any and all of the Gods, which is probably what Tyagaraja meant. A dip in the River Ganges, in North India, is said to expiate all sins. Many holy towns lie on its banks. Some "licensed out" words: Daasharathi- son of Dasaratha, Rama; dhyana- meditation; dadhi- milk curd, yogurt. While Tyagaraja's point in the earlier parts of this kriti, is about being discerning and serving God, we can see his wider context of the ephemerality of material objects, true to his Advaitin heritage. In fact, man's conflict with his baser instincts, mainly the lust for wealth and power, and the teaching that succumbing to them, could only to be one's detriment in the long run, is a very ancient and very common theme in all cultures, from the earliest literature known to man. 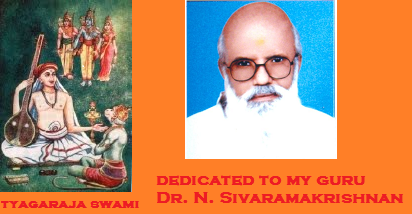 We know that Tyagaraja did not choose the path of the craven and lived his life out a saint. What happens if one does choose the craven path? So, Faustus could have thrived and achieved on his own; but temptation forced him to go over to the dark side and he paid the price. Some of Goethe's Faust, in German, the most celebrated work in that language, was actually written during Tyagaraja's own time. Goethe is said to have taken almost 60 years writing and revising his work. It ends with an amount of redemption for Faust, as he does go to Heaven. Interestingly, Goethe was also a competent scientist for some of his life, and an administrator. The two Fausts and Tyagaraja's song may differ in some of the contextual details, but the message is that we should not yield to temptation. While Faust takes an explicit shortcut against the law of Nature, and probably Man's law too in some places, Tyagaraja is warning us to not seek even justly gained material pleasures. The king, himself a connoisseur and a composer, would only have been rewarding his genius, and no dishonesty or shortcuts were involved. But among pious Hindus, then as now, all material wealth, whether rightly or wrongly gained, is itself considered a pollutant and an evil at a par with the ways of the deal Faust makes with the devil. It is a long held Hindu belief, that without austerity there can be no enlightenment. The pursuit of enlightenment and not the pursuit of happiness, is the Hindu way of life. Tyagaraja and his historical context: I have often wondered what living by the exhortations he makes in this song, would have actually meant to Tyagaraja. Two hundred years later, it is easy for us to forget the daily context, and just take it as a sign of his impending deification or Moksha. But, at that time? In his time? What did living with such arduous convictions do to him and how did it temper his later music? As noted above, legend tells us that, Tyagaraja's repudiation of wealth and "Narastuti" was caused by an invitation from Raja Serfoji II. Actually, Tyagaraja makes almost a dozen stronger rebukes of materialism in his songs - Durmargachara, covered on this site, is one such example. So, why should this graphic legend be attached to this one song alone? I say legend with some trepidation, but my defence and excuse are that we really have no certain documentation of this case too, just like with many other Tyagaraja incidents. Anyhow, granting this Serfoji II incident to be the complete fact for a moment, let's try to decipher what his action might have meant, in the practical sense, and what his motivations might have been, and the consequences. For, saint he might have been, and it might have been a simple age, but then too, were practicalities of everyday living to be answered. Mozart's lavish spending resulting in financial turmoil is well-known. Wagner, was frequently in debt, and bankrupt more than once. In fact, he had to flee his creditors across Europe several times. Of course, the culture and system in India were both different, and Tyagaraja followed Nadopasana or Nadayoga doctrince. Tyagaraja's time lay right at the eve of British ascendancy in South India. They had just succeeded in the Carnatic Wars. Serfoji II, though a monarch, had little power, and his court can hardly be compared to that of, say, Krishnadeva Raya. He was already a pensioner of the British administration. With the decline of Vijayanagara by the early seventeenth century, the power vacuum in the deep south of India, was filled by a combination of some former Naik governors declaring independence, some newly risen nawabs, and vast number of liminal chieftains. This did not provide a conducive environment for Music and the Arts to flourish. A flourishing empire such as that of Vijayanagara or of the Pallavas, could systematically patronize the Arts over a period of some centuries. But, well before Tyagaraja's time, this had ceased to be the case. Patronage lay largely in the hands of individual chieftains, prosperous merchants and so on, and rarely continued for decades. It was a highly disorganized and decentralized system. Printing and publishing too, though known, had not yet taken off, and music transcription was hardly mature, not to speak of music composition or performance being sustainable careers - often the artiste ploughed a lonely furrow. With the nation being in upheaval and patronage remaining on a low scale and not a grand scale, such as a court-composer at a contemporary great court in Europe might command, the highest patronage offered by Serfoji or another ruler, might not have been much! Tyagaraja, we may deduce, refused patronage with strings, and did not abjure all patronage. It was not a time or place in which one may refuse royal patronage only on pain of death, and walking two days in any direction put one out of Serfoji's dominions! Refusing Serfoji's patronage may not have ruined a composer and Tyagaraja indeed was supported by a few private patrons and friends, such as during his long pilgrimage to the north. Tyagaraja, it must be remembered, was not an unattached wandering monk, like say, Sadhashiva Brahmendra, but a saintly householder, and certainly maintained and taught a small corps of disciples who preserved and gifted his work to posterity. We may therefore take this song as a rebuke of all baseness than of all wealth, - "Be craven in nothing at all!"